At this time you could legally mail children. It was actually done several times. Postage stamps were attached to their clothing and the children rode with railway and city carriers to their destination. When the Post Office Department found out this was occurring, they issued a regulation to prevent “the sending of children in the mail”. There are definitely times when I’d like to mail mine away, but with today’s postal rates it would bankrupt me. Above: Souvenir cover from first Highway route. 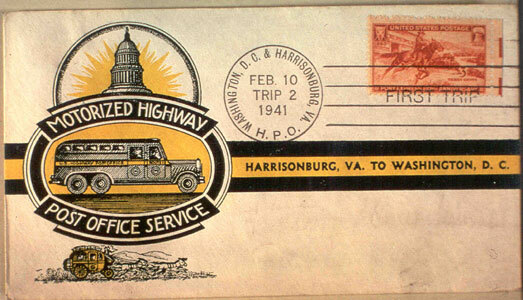 February 10, 1941 the first Highway Post Office service began between Washington, D.C. and Harrisonburg, Virginia. Special buses were used for this service. They were configured to allow clerks to sort the mail in transit. There was a Railway Post Office service, but rail travel was rapidly declining so the Highway service was started to replace that service. 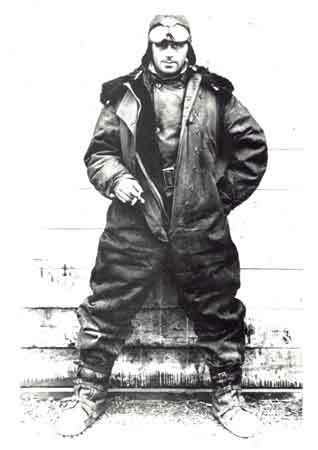 The expansion of the service was delayed by World War II. 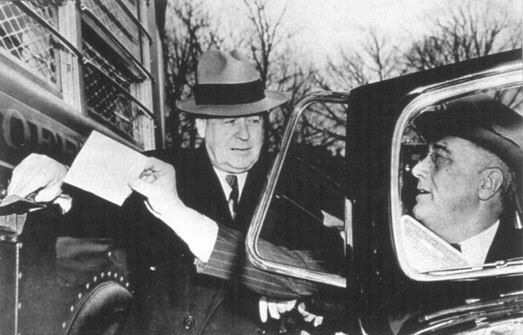 In 1946 a second route was created. 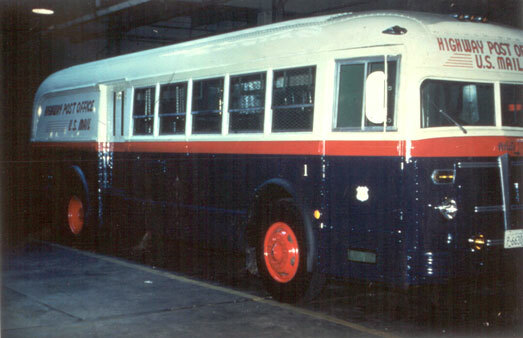 The buses became a common site on American highways during the 1950s and 1960s. Each route served about 25 post offices. In the 1970s the Post Office Department reorganized and began taking mail to regional sorting plants where it was processed using high-speed machinery. As a result the buses were phased out. The last run took place June 30, 1974. The service had been in existence for 33 years. I have been collecting since age 8 years (50 years now). 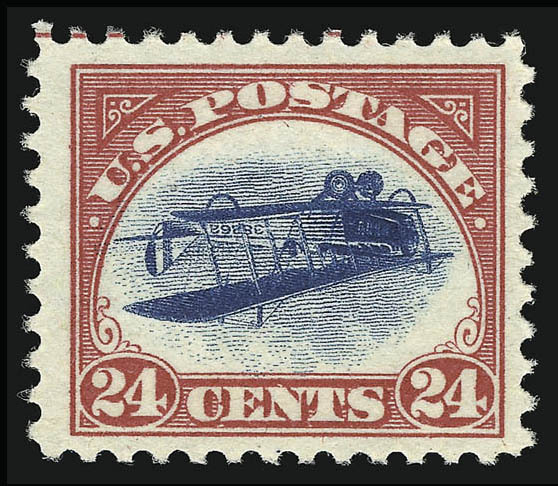 For most of that time I was a “general” collector, I was however, always attracted to the stamps of the United States and especially the airmail issues. In 2003 I finally decided that I wanted to become a specialist for a couple of reasons. One I wanted to learn a lot more about the stamps I collected, and second I wanted to focus my budget on obtaining the stamps I was really interested in. At that time I didn’t even collect covers, but only stamps. A stamp collector friend suggested that I should look into covers if I really wanted to be able to research and learn more about them. A little skeptical at first, I started looking very closely at the exhibits at the shows and noticed that more and more of them were of covers and that those covers told a story that I was attracted to. I was a Second World War history buff This interest came from the fact that my father and a couple of his brothers had served in the Royal Canadian Air Force during the war. 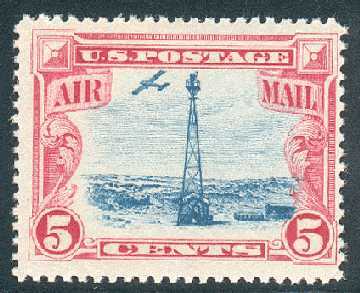 It was at the Edmonton Spring National Stamp Show in April 2004 that I came across the cover that got me addicted to postal history and in particular to the United States Transport Airmail Issue of 1941-44 (Scott C25 – C31). I was looking through a dealer’s box of U.S. covers when I saw this cover that I just knew I had to have. 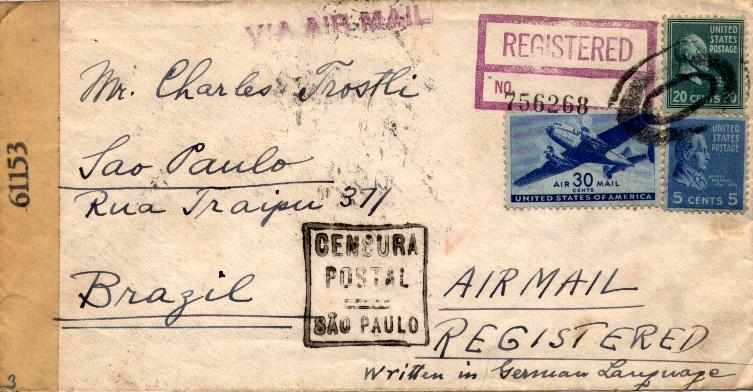 It looked so very interesting being a registered airmail cover to an exotic destination, Brazil. Not only that, but it was dated October 9, 1944 and was censored. A Second World War cover. Immediately I wanted to know more about the censorship of mail, the rates and how the cover was carried to Brazil during the war. The handwritten notation “Written in German Language” totally fascinated me. Could this be a letter from a spy or to a war criminal? All these fantastic thoughts went through my mind. Not only that, but it had a stamp with the plane on it. This also attracted my attention because it was a U.S. airmail stamp that I had seen before, but never postally used on cover. Also I just like planes. So how could I resist. I had to have this cover. I bought it even though I did not collect them. On the three hour drive from Edmonton back to my home in Calgary, my minding was swirling with thoughts of this cover. I just had to learn more about it. When I got home I immediately started researching using the Scott catalogue and the internet. I found in the Scott Specialized catalogue that the 30c Transport stamp on the cover was issued in 1941 and was part of a series issued during that year. At this time I knew nothing about rates. On the internet I found the book I needed. This was “The Transports” by GH Davis. I immediately ordered it from the United States Stamp Society and waited for it to arrive. This particular cover it turns out is not a rarity or not even that uncommon because mail to South American was never interrupted during the war. I did find out that the valid airmail rate to Brazil at the time was 40c with the foreign registry fee being 15c. The postage on the cover totaled 55c. Therefore this cover had proper postage paid in the correct rate period. Turns out that the censorship regulations required that letters written in foreign languages had to have that noted on the outside front of the envelope so that the censors could make arrangements for a translator to be available to read the letter. Further research showed that South American countries, and in particular Brazil, had many German immigrants during the first part of the twentieth century, so it was not at all unusual for this letter to be written in German. That was a bit of a let down, I was expecting or hoping espionage might be related to my cover. A couple of weeks later the book arrived. I read it from cover to cover, and back again. Totally fascinating. Here was all the rate information I needed and detailed data on each of the denominations of the Transport airmail issue. Away I went to eBay and other on-line auction sites and started searching “Transport” as a key word. Bingo! Lots of covers for not too much outlay of cash. Managing to pick up many covers over the next few months I started researching the covers as I got them for rates, routes and any history behind them. I especially enjoyed the APO covers and trying to find out about the various military units and the history behind them. Here I am four years later and I am still hooked. Since starting in 2003, I have built my exhibit of “Usages of the U.S. Transport Issue 1941-44” that has evolved from being awarded a Silver (at two frames) at its first showing, to a Vermeil (at five frames) at its most recent showing in late 2005. 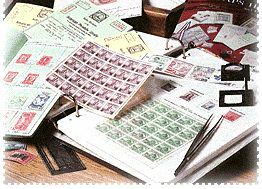 Most of all though I have combined a couple of my interests, philately and WW II military history. The result is that I am just having way too much fun!! You are currently browsing the archives for the postal history category.